Indoor ATM cash machines for retail merchant locations such as Convenience Stores, Casino Gaming, Shopping Malls and Retail Strips, Nail and Hair Salons, Night Clubs, and other average to high foot traffic locations! We sell almost every ATM being manufactured today. 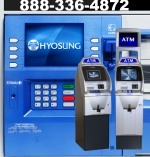 IndoorATM.com features Hyosung, Triton, and NCR ATMs made for indoor use. If you do not see the ATM you want to purchase on IndoorATM.com, call us! We will get you a price quote on any ATM model you request. An automated teller machine lets your retail customers pay you in cash. This reduces personal check use and can reduce credit card fees. It also brings in customers that need the convenience of being able to access their bank accounts, 24 hours a day. Most Indoor ATM models are also available with options and upgrades such as an electronic ATM lock, multiple cash cassettes, color monitor upgrade, and ATM topper sign. Some ATMs have free shipping, others do not include shipping..
That flashing ATM sign means there is an indoor ATM machine on the premises. Automated teller machines can be owned by retail merchants, business owners, land and property owners. Some ATM owners place multiple machines in other businesses and have a "route" much like a vending route. Automated teller machines purchased or leased from IndoorATM.com include ATM transaction processing by MAG. Low monthly cost and no hassles. If you currently own an automated teller machine and need a processor to make it work, we can transfer your ATM processing. Nationwide service and ATM parts are available as well when we process your ATM. We handle all logistics of purchasing an ATM machine. From ordering to shipping, coordinating installation and programming, we handle part of it, or all of it, depending on your requirements. Most important, we will be here tomorrow to service what we sell today. All ATM owners receive the same quality of customer service no matter if you own one automated teller machine or one hundred machines. We appreciate all of our customers past, present and future. We’ve been selling and leasing ATMs for over 15 years. We’ve never had an ATM returned for any reason. The ATM of today actually needs very little service. We order very few ATM parts. Repairs can usually be made without an ATM tech. ATM parts are mostly plug-and-play type parts. Remove a couple of screws, plug the new part in, and the ATM is fixed. The main problem an ATM faces is communication errors as phone lines are being ran through routers these days and analog lines are replacing digital. We sell and ship ATMs nationwide! With prices starting under $2500, There has never been a better time to buy! Shipping is included on some machines. Programming and installation not included in price.